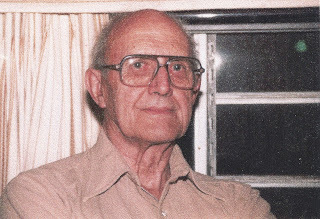 George and Orilla Sarah Jones are reversed in many official and unofficial records. After the Bayocean Natatorium became unstable from ocean undercutting in 1932, it was closed permanently. 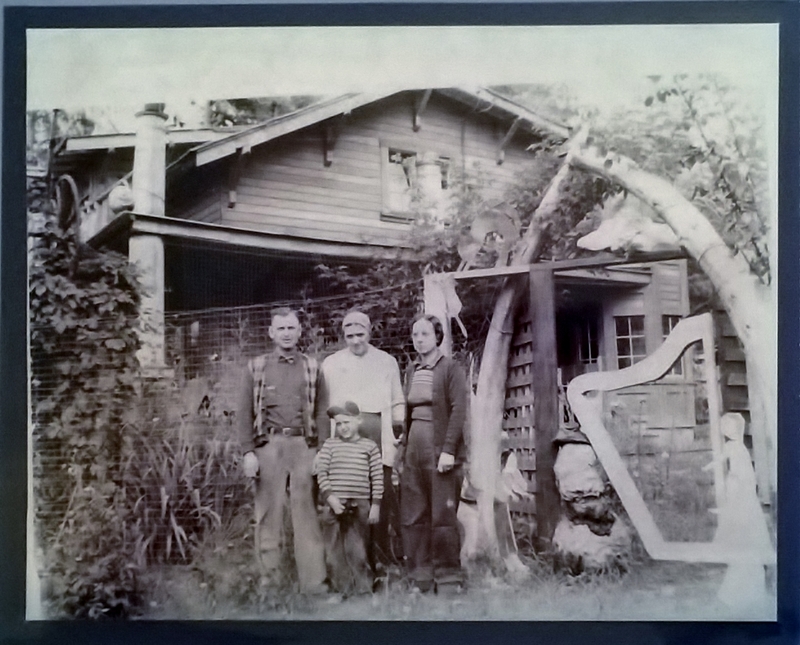 A handwritten note from Howard Sherwood, Jr. (Buck) in the Cape Meares (Bayocean School) Community Center scrapbook says that George A. Jones salvaged its lumber to build a large house for himself and his wife "Rilly" on Cape Meares in 1933 and 1934. He also installed a buggy above a tall hop plant out front, rented out a few rooms, kept a few grocery items to sell picnickers, and called their place the "Buggy Knot Inn." attributed to the Bayocean Natatorium are shown extending above the roof. used in newspaper articles, books and on websites, like mine. Testimony submitted to the US Army Corps of Engineers (USACE) by Jones in 1938* suggests another source of lumber for their home. He reported surveying and supervising early construction on Bayocean, from 1907 to 1909, and returning to the area in 1930. In 1932 he purchased and deconstructed the summer cabin of D.S. and Vesta Williams. In 1961, Samual Dicken, head of the Oregon State University Geology Department, wrote in a report titled "Some Recent Changes of the Oregon Coast" that the Williams cottage was on a bench in the dunes about 50' above the beach and that he measured erosion at 1' per year from 1926 (when it first became noticeable) until 1932 when it jumped to 6' per year. Tillamook County Deed Book 32, page 535 (DB 32:535) shows they purchased lot 22 in block 67 (67:22) in 1915. Judge George Bagley and Swan Hawkinson, who also had Bayocean cottages, confirmed Jones' account in their testimony to the USACE. Hawkinson said the Williamses first tried moving their house uphill and away from the ocean. Their cottage would have been much smaller than Jones' house so he needed more lumber. Buck Sherwood told Mike Watkins, his boyhood neighbor and lifelong friend, that Jones built the house for less than $1000. This figure would have included what Jones paid Williams and the Tillamook-Bayocean Company who then owned the Natatorium. Why didn't Jones mention Williams to Buck (his family didn't move to Bayocean until 1938, so all of what he wrote must have come from Jones)? Perhaps it just wasn't as good a story. If Jones had realized it, he could have bragged that some of his home's lumber came from the most northerly home ever built on a Bayocean lot. The Williams cottage was near the end of the paved section of High Street, a half-mile north of the first house lost five years earlier, and 1000' north of the Mueller cabin (see the map in that post to locate these properties) moved over to the bayside five years later. Jones had purchased the lot (12:15) in the Oceanview Subdivision from George Higgins back in 1915. 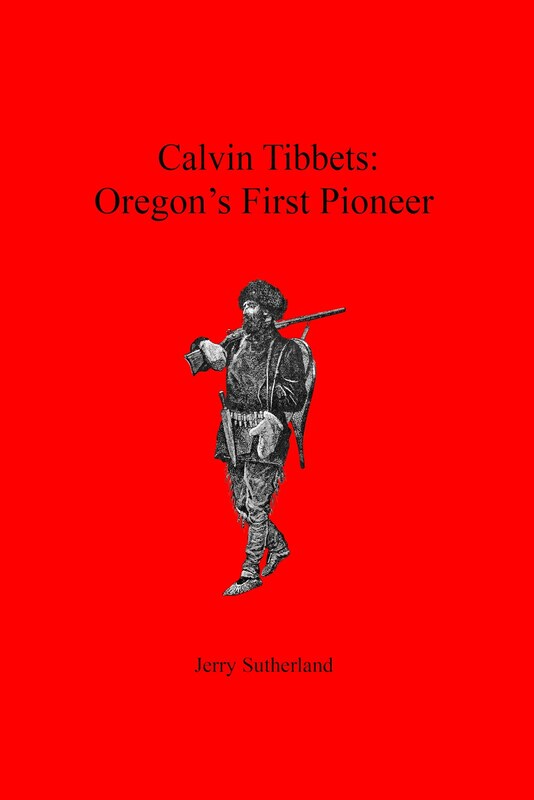 While still serving as the Cape Meares Lighthouse Keeper, Higgins took advantage of Bayocean publicity by developing and advertising his lots in Tillamook newspapers (the Potters advertised in big city papers) as a lower priced alternative. Jones and his wife bought eight adjacent lots (7-12 and 16 -17) during the 1930s. Buck said his family moved into the house in 1940. The deed for Howard (Sr.) and Maude Sherwood's purchase of all nine lots was not recorded until 1948 (DB 116:269) so they likely bought them on contract. Members of the family continued living there until 1990, which is why neighbors still refer to it as the "Sherwood House." See the Index page to find more stories like this. * From USACE records at the Seattle branch of the National Archives: POR-81; Civil Works Project Files, 1902-1968; Box 175; File 7250 Bayocean Preliminary Exams & Surveys. was the last structure to go, in 1971. When the US Army Corps of Engineers (USACE) built the breakwater that reconnected Bayocean spit to the mainland in 1956, they also bulldozed and burned all but three of the buildings still standing, and then backfilled the entire area with sand dredged from the bay to add elevation and avoid future breaches. 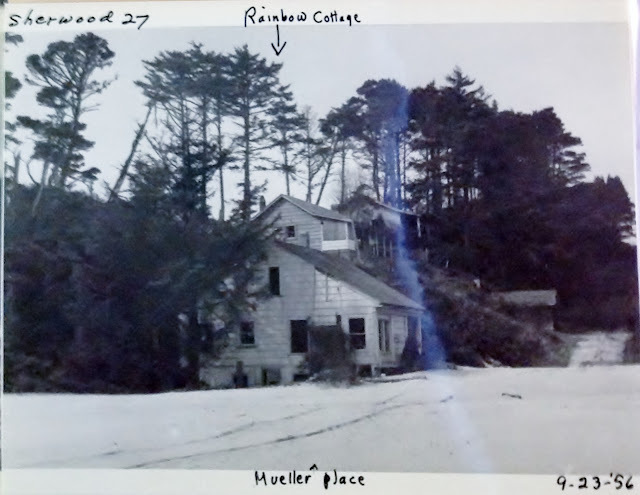 The house in the photo with its basement filled with sand and labeled "Mueller place" had been moved there from the northern ridgeline a couple decades earlier - to escape erosion. 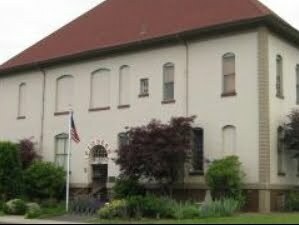 According to Tillamook County Deed Book 67, pages 280-281 (DB 67:280-281), Conrad and Elvira Mueller purchased lot 52 in block 67 (67:52) on June 11, 1932. This was on the ocean side of High Street, about 3/8 of a mile north of the Poulsen (later Hicks/Dolan) houses, directly across from the first Bayocean house owned by Judge George Bagley, at lot 62:A (he also owned adjacent lots 13-16). Testimony submitted to the US Army Corps of Engineers in 1938 by Judge Bagley (POR-81; Civil Works Project Files, 1902-1968; Box 175; File 7250 Bayocean Preliminary Exams & Surveys. Seattle NARA) said that a newer house across the street from his had been moved down to the bay just the year before (1937) in order to avoid the threat of erosion. Bagley and others mention two other houses in the same block that were deconstructed instead of moved. The Muellers likely chose to move theirs because they had just built it (one can only imagine that the rate of erosion had suddenly increased). D.C. Baker built a basement and placed the house for the Muellers on a lot they purchased June 7, 1937, at 57:29 (DB 74:89). "Bayocean News" columns in the Tillamook Headlight Herald gave periodic updates during the summer and fall of 1937, talked about Baker having been an early manager of Cottage Park, and declared on October 7th that the house was "practically ready for occupancy again, after being moved from the hill to a location near the [Rainbow] Girl's Club building." They later purchased adjacent lots 30 and 31 at foreclosure sales. as is the route their house would have taken. Bagley lots are in orange. Other landmarks are purple. The Muellers called their cabin on the bay "Huckleberry Inn" and traveled from their home in Portland to stay there frequently. A sketch on page 81 of Bayocean: The Oregon Town That Fell Into The Sea refers to Conrad as "Horse." This is interesting given his WW II draft card lists his height at just 5'5". Censuses and directories indicate Mueller was a building contractor, so perhaps great strength earned him the nickname (sources were viewed at Ancestry.com). On May 8, 1945 (DB 90:607-608) the Muellers sold their cabin. By the time Perry Reeder's family rented it in 1947 subsequent owners had hung a sign on the front porch renaming it the "Dew Drop Inn." Perry recalls the vine roses clinging to a fence that ran the perimeter of the property and made good use of the large chicken coop in the back. 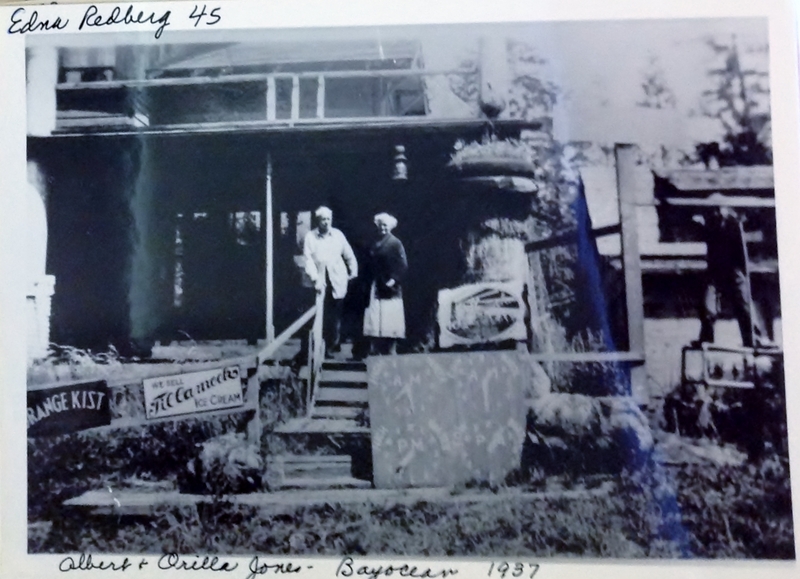 The last owners of the house were the Currins, who purchased it June 25, 1952 (DB 134:90-91), just five months before the entire southern part of Bayocean was blown out by a winter storm. This was the fourth house lost by the Currins on Bayocean. If they reasoned that "this would have to be one of the last houses to go" when they bought it they would have been right - but it did go. See the Index page for other posts listed by category.